This year’s Effie Awards Finland Gala was hosted by MTL and took place at Finlandia Hall on October 29. There were 2 Gold Effies awarded at this year’s event. The Grand Effie went to the campaign “Halpuutuskampanja Prisman historian suurin volyymiloikka.” Behind the campaign was SOK, Make it Simple Oy Helsinki, Insano OY, Carat Finland, and Mr. Wolf. The jury found this campaign to be the most versatile marketing effort with the most powerful communication effort in this year’s competition. The other Gold Effie winners were Filialen BYGGmax AB Finland, Folk Finland Oy, Medistoimisto Voitto, Woodpecker Film, and Manifesto Consulting for the “Miten ruotsalainen oppi kohtaamaan suomalaiset” campaign. The precise target group and exhilarating advertising led to one of the most commercially successful campaigns. Tommi Laiho, chief judge of the 2015 competition, remarked of the Miten ruotsalainen oppi kohtaamaan suomalaiset campaign, "For once, there is no doubt as to the impact of commercial advertising." In addition to the Gold and Grand Effies, there were two Silver and four Bronze medals awarded at this year’s gala. Helen, N2 Helsinki and Dagmar’s “Maailman Parasta Kaupunkienergiaa” campaign took home one of the Silver Effies. The jury described Helen's branding and marketing as having a distinctive character. 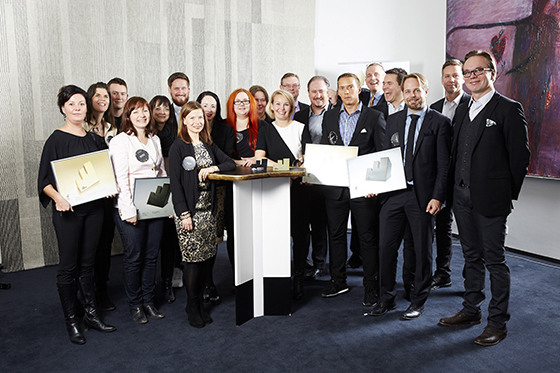 The second Silver Effie went to the Metsä Wood's campaign, “Metsä Wood Plan B.” The jury described the idea as one of the best in the competition. Behind the campaign were hasan & partners, Sec Public Oy, and Voima Graphics, as well as the architect offices Helin & Co and Michael Green Architecture. The four Bronze Effie winners were: “Deluxe rakentaa suomalaista ruokakulttuuria,” from Lidl, Folk Finland, Virta Helsinki, FLC Helsinki, and Filmiyhö Otto; “Tupla Energy Company- kahdessa kuukaudessa patukkamiehestä tubettajanuorison ykkösvalinnaksi” from Cloetta, ToinenPHD, and Kuubi; “Valio Hörppy – Ianseeraus eli miten saatiin kulttimainetta nauttiva markkinajohtaja polvilleen” from Valio, Bob the Robot, Virta Helsinki, and Bob the Robot Pictures; and “Vianor ja Hammerfall – mailman katsotuin kesärenkaiden vaihto” from Vianor Oy, SEK & Grey, Nitro Films, Medistoimisto Voitto, Wolti Group, and SEK Public. This year’s campaigns were evaluated by a jury of 21 marketing and communications professionals, representing clients, agencies, universities and media.